So you want to get a Bible for your Chinese friend, but you don’t know which translation to choose. You aren’t alone. There are more than a few choices and it shouldn’t be surprising that different folks might have different opinions on the matter. At the risk of adding one more opinion to the (already longish) list of opinions, here are a few thoughts and recommendations to help you choose. Translation is a complex enterprise, even under the best of circumstances. Effective translation requires a myriad of choices as to how best to communicate the words to be translated (which is why Google Translate, for all its merits, still struggles with the task). While conveying accurately the meaning, a translator must also weigh issues of grammar, tone, and how best to render idiomatic expressions, among other things. The issue is further complicated when the text being translated is the Bible, because a poor translation can obscure or even change the meaning of a particular passage. Without going into too nuanced of a discussion, Bible translation generally seeks to preserve two dimensions to the text: literality and readability. So, for example, an interlinear Bible, where under each word of the original text is a translation of that word, is extremely literal, but not really readable. Sometimes interlinear Bibles are used as a help for delving into the original languages, but they’re not the go-to choice for ease of reading. On the other end of the spectrum would be a paraphrase, like The Message, which tends to be very readable, but not very literal. If you’re trying to do a word study or to recover the grammar of the original text, a paraphrase probably isn’t the right tool for the job. The ideal translation, if there were such a thing, would be both highly literal (i.e., preserving, insofar as possible, the original grammar and vocabulary) and highly readable (i.e., providing a rendering that is easily grasped). With the basic sketch of translation theory above, we now have some workable (if rudimentary) criteria for evaluating translations. When you’re picking a Bible to give to a Chinese friend, you’d ideally want something that is quite literal and quite readable. Probably the two translations that I see the most are the Chinese Union Version (CUV, 和合本) and the Chinese New Version (CNV, 新译本). On many occasions, the CNV sticks fairly close to the CUV, but there’s little doubt that the CNV is the more readable of the two. As for literality, the CNV probably comes out on top here too. (Full disclosure: Chinese is not my native tongue and most of my Bible reading is done in English.) One version that is perhaps worth mentioning here is the Chinese Standard Bible (CSB, 中文标准译本). I attended a conference during which some of those working on the CSB attended and detailed some of their translation work. My impression was that they were really trying to do justice to these two dimensions of literality and readability. I came away impressed, and I’ve since had occasion to use the translation, though, at the time of this post, only the translation of the NT is complete. In a vacuum (and with a complete Bible), this is probably the version that I personally would choose. So far, so good. But, there is one more factor that I think is worth considering, and this is a particularly weighty one. 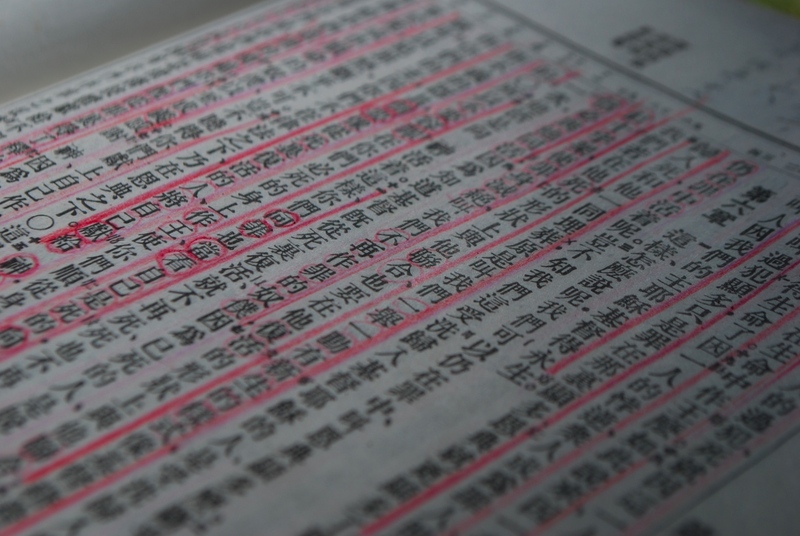 In the context of worship services and Bible studies in China (or even among Chinese churches in the US), the CUV is overwhelmingly the translation of choice. In my mind, there’s both positive and negative to this. Positively, it gives Chinese Christians a consensus common translation to use in public worship and other contexts where the Bible is used. Contrast this situation with that of the English-speaking Christian community, where we have an embarrassment of riches when it comes to translations. But for all of the translations we have, what we don’t have is one consensus version across all traditions and denominational lines. In my experience, I’ve found the Chinese to be terrific at memorizing Scripture; I’ve been in services where the pastor is quoting from a particular passage of Scripture and congregants around me begin chiming in with the pastor and reciting the passage in unison. That can only happen if the pastor is reading from the same version that you’ve memorized, which is made possible in the Chinese context by the consensus use of the CUV. Because of the fragmentation of English translations, it’s difficult to envision that same scenario ever really happening here in the West. Negatively though, the CUV doesn’t seem to be the best version if judging by the above translation criteria. It’s cumbersome to read, even to native Chinese speakers, at least at first. A common refrain among new Christians trying to read the CUV is that they can’t understand it. The best analogy (from an English speaking perspective) would be that it is somewhat akin the the King James Version. As an older translation like the KJV, it contains language that makes it more difficult for modern readers to read and understand. So what version should you give to your friend? If it were me, I would definitely give the CUV in some form. Assuming that your friend at some point may return to China, and will get involved with a church there (I hope that your friend is involved in church here, but I’m purposefully sidestepping the question of involvement in English-speaking or Chinese-speaking church in the US. That’s worth another separate post. ), he or she will need to use and be comfortable with the CUV. The overwhelming use of the CUV in churches is more than enough reason for me to recommend that a new Chinese Christian have it and begin reading it. At the same time, I think multiple translations are a good thing. They offer a basis for comparison, and one translation may offer a rendering that helps clarify a phrase or passage that’s difficult to understand in another translation. So I might opt for a parallel Bible, like a CSV/CUV (though this is only the NT), or for a Chinese-English version, maybe something like CUV/NIV or CUV/ESV. But whatever I did, I would try to encourage my friend to read the CUV as the primary translation and consult others when the translation is unclear or when a change of translation might offer a helpful new perspective on a familiar passage. One last thing. In today’s digital age, it’s easier than ever to compare different versions. Bible Gateway has all of the versions mentioned in the post freely available online. And there are a wealth of mobile Bible apps (like this one), many of them free, that can be downloaded and installed onto mobile devices. There’s really no reason for your friend not to have all of these translations with them at all times on their mobile device. Thank you very much. This was an extremely helpful article and you addressed all the important issues clearly and concisely. As a (non Chinese speaking) evangelist (to the Chinese and others) I appreciate the help on what translation to first introduce them to. Davy, thanks for the comments. Starting out, let me say that I am also not a native Chinese speaker. I would not recommend the Chinese Union Version as, in my experience, it will be very difficult for new believers who did not grow up in the church. The people I meet who most strongly push its use often no longer read the bible regularly. I’ve compared many passages in various translations and I’ve had many people give a lot of feedback of various translations. For readability and accuracy balance, the Chinese Contemporary Version and the Chinese New Version both are very good. For best readability (and not just vernacular but just good, readable Chinese) the Easy-to-Read Chinese is voted best by my non-believing Chinese friends, but I have found at times is interprets instead of just translates. But still a very good translation. The Chinese New Living Bible is translated mostly from the English New Living Bible rather than from the Greek and Hebrew.